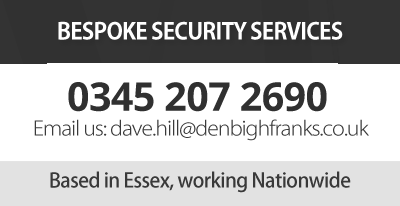 Please check out the other security services which we provide here at Denbigh Franks Ltd. Possibly the largest growing sector that falls under the security banner. In today's society companies are being forced to consider this as an option in the battle to combat shrinkage and falling profit margins. We have noticed that over the past three years it's not only theft we are dealing with but the staf'fs safety and building protection. However, we also recognise that the sight of a often intimidating security guard can be off putting to the customer. Therefore we have created a retail security division that is not only expert in its field but is designed to be discreet and professional not to mention smart and approachable. It is proven in numerous cases that the introduction of a security presence has played a key part in restoring sales and driving up profit lines. Probably one of the most diverse and bespoke types of security requirement we handle. From working on countless different locations and filming assignments. We understand that each filming has its own challenges and bespoke setups. We appreciate that it’s not only the site that is different every time but the staff and set requirements are. From VIP and celebrity film sets, to protecting news crews in hostile situations right through to guarding temporary filming locations and escorting mobile filming on busy streets. We have the experience and resources to cover all eventualities whatever may be involved. Do you have the need for full time security? Look no further as we pride ourselves on the second to none service we provide. All of our guards are fully SIA trained; experienced professional guards. From single man sites to round the clock teams, securing large sites we have the resources to handle every occurrence. We pride ourselves on the relationships we build with our clients. We do this by listening and recognising their needs. From listening and working with each and every client we then build a package that completely suits you the client’s needs. We feel that to get the most out of our service it is paramount to tailor our approach to delivering your security service with your business’s and staff’s safety and requirements’ as absolute paramount. That’s why we listen and ever evolve our service to move and change as your business does. From years of operating within the Private Security Industry, being faced with thousands of situations, not one of them the same. We have become experts in adapting to the clients individual needs and requirements. We completely understand that no two jobs are the similar and that each and every detail no matter how seemingly meaningless to one might be paramount to another. This is why we take our time to work with and listen to our clients making sure we cover and suitably fulfil each of their needs. We use the term "Private Security" loosely as its meaning has a multitude of different things to different people. "Private security" to us can be absolutely anything that needs protecting. It is private to you so therefore it is Private security. Our flexibility to tailor and react to each and every situation is un-rivalled. From assisting a school run and walking a dog to round the clock residential protection right through to international travel and business escorting. We provide ourselves on listening to our client’s ad creating a package bespoke to their needs. Site security is becoming more and more of a necessity than ever these days we are finding. From a camping site to a building site. Clients require their site physically guarded more now than ever. We have assisted businesses in many ways protecting their sites for not only thieves but vandals and general trespassers. With the statistics that petty thieving and vandalism is costing business not only in replacing physical losses but management time and rising insurance policies, we are now not only seen as a cheaper option but also regarded as an investment. All of the above are site specific and available on non-fixed contracts. Looking for security but don’t need a permanent guard? Want more peace of mind than an alarm can give? Why not use our mobile patrol service? We have trained experienced guards patrolling all areas throughout quiet times giving a professional and visual deterrent protecting your building or business. We have proven to our clients that we are effective in our work noticing the level of crime and vandalism drop considerably in some areas. We have now noticed that our service is being treated as an investment rather than a deterrent. Are you a landlord? Do you own vacant commercial properties? Have a property that's between tenants? We can help. We work with a large network of landlords, lettings agents and pub groups helping them with all of their vacant properties requirements. Be it lock changing, replacing doors right through to completely boarding up all possible entry points and installing temporary monitored and CCTV. Your property will be secured round the clock. Even in a vacant property we have the resources to put in state of the art CCTV cameras that communicate with our response centre at the same time as giving us alerts and feedback from the cameras should anything trigger them. On top of that we can offer a managed service where we are on hand to lock/unlock giving access to builders, project teams etc. It’s simple – you can manage your vacant property from your phone anywhere in the world without even having to go there. Let us take the stress out of it for you. We offer a low cost no nonsense service which is fast and efficient. No matter what the problem no matter how big or small. Get in touch to see how we can help. Be it an empty building that needs temporary full time physical presence on site or you and your loved ones that would benefit from the peace of mind that on hand assistance brings then we have the resource to help. It is more often than not that the licenced trade use our service to babysit and manage their properties whilst they go through the change of ownership and preparation works are being carried out. We offer a fully supported round the clock service which looks after the property by physically guarding it throughout the whole time it in-occupied. Nothing rates higher than personal security for your family, loved ones and homes. The threat of any of these being compromised strikes panic into the heart of most. From years of experience we have gained a wealth of knowledge and experience from witnessing situations similar to this in a variety of circumstances we have geared our business to be ready and able to cope with any situation which may occur. If you would like to find out more about the bespoke security services we provide here at Denbigh Franks, please do not hesitate to get in touch today. We look forward to answering any questions you may have.